Many companies are choosing to outsource their transcription because they realise the advantages it has. When you consider the wages, benefits and overheads of an in-house transcription department, it can be very expensive for any company. At first, it would seem that choosing to outsource your transcription would add cost to running your business. This is actually not true, outsourcing to a third party outweighs any perceived disadvantages. Let us take a look at the five advantages of outsourcing transcription services to your organisation. You only pay for what you need, when you need it: Your transcription volume and requirement will fluctuate. Most companies will not need large volumes of transcription carried out on a regular basis. The fluctuating nature of your transcription requirement means it is difficult to ascertain how many in-house transcriptionists you will need at any one time. By outsourcing your transcription, you literally only pay for what you need as most transcription services only charge by the minute rather than the hour. Outsourcing transcription saves money: The cost savings with outsourcing transcription instead of employing full-time transcriptionists in-house is significant. Therefore, you will have the expense of a full-time secretary, a freelance transcriptionist will be able to provide their full expertise at a fraction of the cost you would need to pay for an in-house transcriptionist. Access to experienced staff: Transcription is not an easy job, it is a niche skill set. 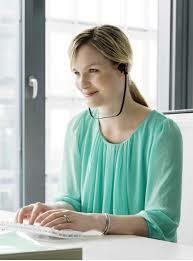 There are not that many people with the required skills and competence for transcription. It requires focus and attention to detail as well as a keen ear. Using less experienced staff can result in inaccuracies and completion delays. By using an outsourced transcription service, you will tap into a huge bank of experience for a small percentage of what you would otherwise have to pay. Flexibility: Success in your industry requires managing rapidly changing environments. Transcription providers give you the flexibility to meet these rapidly changing conditions. The challenges for businesses include varying transcription volume, different turnaround times for different projects and cases, adding new services and departments, contraction, report format changes, etc. Outsourcing transcription frees up time for your staff to develop other skills: Transcription is a specialised skill. Not every secretary can transcribe with accuracy and expertise. Most employees have skills that are better suited to other activities. Outsourcing transcription means your personnel is used more efficiently and productively with minimal investment. This increases productivity and saves costs. Choosing the right company for your outsourcing needs is vital. You must ensure that you are happy you will receive a professional service and results, and that you trust the company before engaging in business with them. Understandably many projects can be of high importance with close attention to detail necessary. If you are looking for Confidentiality, Reliability and Able to Deliver on Time, then you have come to the right place.